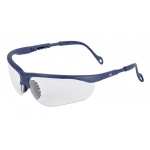 DESCRIPTION: Glasses endowed with a 9-point bending lens which ensure a high optical quality without vision distortion. Nylon frame with a regulation system of the length of the temples, able to offer a better adaptability to the face. Nose pad made of soft and comfortable material.